Lightning is a capricious, random and unpredictable event. Its physical characteristics include current levels sometimes in excess of 100 kA and speeds approaching one third the speed of light. Globally, some 2000 on-going thunderstorms cause about 100 lightning strikes to earth each second. Lightning is a product of electrically charged storm clouds. The charged clouds induce an opposite charge (ground charge) on the surface of the earth beneath it as they travel through the atmosphere. When the ground charge reaches a structure, the cloud charge pulls it up onto the structure, concentrating the ground charge on and around it. If the ground charge builds to a level exceeding the dielectric (insulation resistance) of the intervening air, an arc or lightning strike will occur. The process begins with stepped leaders branching down from the clouds. When they come within close proximity to the ground, approximately 500 feet, the electric field intensity at ground level becomes so strong that objects and structures begin to break down electronically, shooting streamers up toward the stepped leaders. When a streamer and a stepped leader connect, a path is created for a lightning strike. To protect the buildings or telecommunication towers against lightning, a proper designed lightning protection system is needed. The main function of the lightning protection system installed on the existing building is to capture a lightning stroke and then conduct discharge current safety to the ground. As shown above, the building requires number of copper rods, number of down conductors, number of earth pits, maintenance of all this put together becomes a costly & wastage of time also. In some conditions, however the active lightning system is the only possible method to protect from direct lightning strokes. Due to the arguments mentioned above, we recommend to use the active lightning protection whenever the conventional solution is inconvenient or when the former is more preferable to the latter as in the case of the efficient protection of architect. Early streamer emitting air terminals are designed to emit a streamer early in the streamer-formation phase of a lightning strike, thereby becoming the preferred lightning attachment point. As the ground charge builds immediately before the lightning strike, the ESE air terminal accumulates ground charge. In the instant before the strike, when the stepped leaders are branching down from the cloud, the ESE terminal emits a series of pulses of ground charge, forming a streamer from itself before streamers emit from other structures. Its streamer reaches the stepped leaders before competing streamers, thereby winning the competition. Ground charge accumulation and streamer triggering is done by FRANKLIN FRANCE Saint-Elmo ESE lightning conductor. FRANKLIN FRANCE's Saint - Elmo reputation in the field of lightning has invested heavily in the manufacture of its Early Streamer Emission Lightning Conductor. This has involved both fundamental research into the physical phenomena associated with lightning, as well as extensive product development. The latest series provides optimal protection against the direct effects of lightning. With piezoelectric exciter device Complies wih NFC 17-102 standard Franklin - France / CEA patent Franklin France presents you the Saint-Elme ® lightning conductor. It results from the research work conducted with the French Atomic Energy Commission, and is the efficient, inexpensive and clean protection solution, using piezo - electric ceramics to transform the wind energy into electric energy. 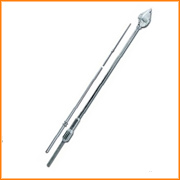 A rod - type lightning conductor, connected to earth, efficiently works by altering, at its level, the equipotentials which match the structures of the building it protects. The emergence of the lightning conductor is an important factor in increasing the local electric field. The principle of the piezoelectric lightning conductor designed by Franklin France relies on several factors : the reinforcement of the local electric field and the early creation of a preferential discharge channel. Transducer (piezoelectric stimulator) Built into the lower part of the pole and consisting of piezoelectric ceramics stressed in an insulating container, combined with a simple, perfectly reliable and mechanical stimulation system (CEA and FRANKLIN patents). A high - voltage cable running inside the pole connects the stimulator to the emitter point(s). The voltage created by the ceramic is applied to the emitter point through the high voltage cable. > The creation of a rising ionized air channel in the prolongation of the lightning conductor, it will lead to the shortening of the excitation lag, and to favourably influence the initial conditions of the triggering of the corona effect. 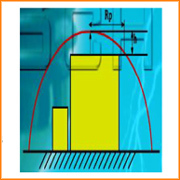 Free charges are created by the corona effect by applying on the Saint-Elme® lightning conductor's ionized point(s) the voltage supplied by cells of piezo-electric ceramics (lead zirco-titanate); their feature is to produce a very high voltage by simply modifying the applied pressure. The Saint-Elme® lightning conductor is therefore equipped with a mechanical device that transforms the stress resulting from the wind action on the lightning conductor into a pressure stress on the piezo-electric cells. The voltage therefore produced is applied, through the high voltage cable that runs inside the lightning conductor's support pole, onto the ionized point(s) to create, by corona effect, free charges. Then, these charges are expulsed, by the venturi system, from the lightning conductor's head, profiled on purpose (forced air circulation). When they are outside the head, these charges are submitted to the cloud-ground electrical field. The charges polarized like the cloud are repelled towards the ground, the channel of charges that forms in prolongation of the lightning conductor is then exclusively composed of charges from the opposite pole to the cloud's electric pole (it takes into account the discharges's pole : positive or negative). The ability to promote excitation at lower values of the electrostatic field (hence earlier) enhances the capture probability of lightning conductors. 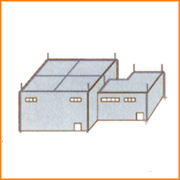 This capacity gives them greater efficiency in the role of "preferential capture points" compared to any other point of the building they protect.Therefore these lightning conductors offer superior guarantees during low intensity discharges (2 to 5 KA) compared with simple rod type lightning conductors, which can only intercept them over short distances (D = 10 I 2/3, where D is in meters, I in KA). The zones of protection of lightning conductors are obtained theoratically by plotting the electrogeometric model, but are comparable in practice, for low heights, to a cone of revolution which apex is the tip of the lightning conductor. 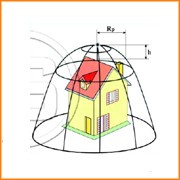 French standard NFC 17 100 describes the calculation method applicable to Franklin and meshed cages rods. French standard NFC 17 102 deals with early streamer emission (ESE) lightning conductors, and takes into account the levels of protection Np of varying severity (I to III), to be determined previously by an assessment of the lightning risk for each project. It defines the installation rules and the radii of protection Rp (m) depending on the average excitation advance ? L (m) of the lightning conductors and the excitation distance D (m), considered according to the degree of severity : D (I) = 20 m, D (II) = 45 m, D (III) = 60 m. The table hereunder gives the Rp (m) values for the three levels of protection Np depending on the actual height h(m) of the lightning conductor in relation to the different planes considered.